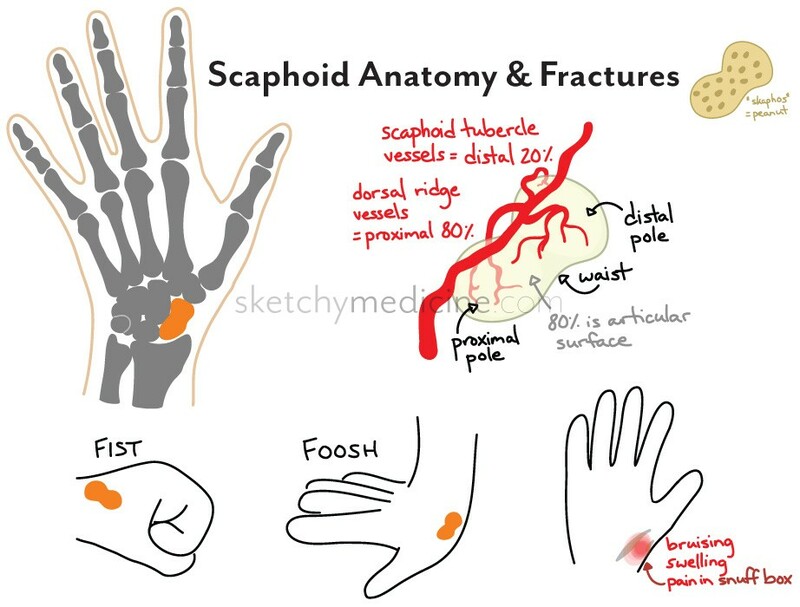 The scaphoid bone is one of the eight carpal bones of the wrist (you can check out this doodle for a refresher). The scaphoid is the most commonly fractured carpal bone, accounting for almost 70% of fractures. It tends to be young males who break their scaphoid this is both an anatomical thing: younger kids get ligament injuries and older folks break their distal radius and a lifestyle thing: falling on outstretched hands (skateboarding, snowboarding) or throwing a punch both place a lot of force across the scaphoid leading to fractures. The bad thing about scaphoid fractures is that the blood supply (from a branch of the radial artery) comes from distal to proximal. Since most fractures happen at the waist of the scaphoid the likelihood of having poor blood supply to the fracture site is quite high. It doesn’t help matters that around 80% of the scaphoid is articular surface (joint surface), so if it doesn’t heel well, it can lead to problems with arthritis of the wrist later on. Scaphoid fractures present with a pretty classic story and the person is usually swollen and bruised and will have tenderness in their “snuffbox.” So even if the x-ray doesn’t show a fracture, it’s best to treat with a cast for comfort and safety and then recheck them in 2 week’s time (this will be discussed in a separate post). This entry was posted in Anatomy, Emergency, Ortho, Plastics and tagged blood supply, fracture, hands, MSK, trauma by Ali. Bookmark the permalink.